The search returns ‘Odeon Crewe’, but not if you search for the Odeon! I was deeply skeptical about Apple Maps after reading about the issues on the internet. However, the reports don't match with my experience of using it as a SatNav. I've done this three times so far, and it's taken me to the location by the shortest route, and without misdirection. Where I do find it weak is in the search engine side. 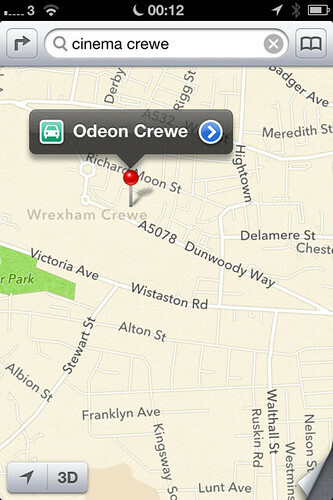 For example, last night I put in "Odeon Cinema, Crewe" and it couldn't find it, but "Cinema Crewe" worked fine. The vector tiling for the map sets is very effective for keeping a larger area within the navigation range and scaleable in comparison to Google Maps. This means you can still zoom in and out and track location when you have GPS but no cell connection. The lack of effective public transport and pedestrian routing is disappointing. The turn-by-turn navigation works well. Overall, as a product, it needs tweaking, but it's nowhere near as broken as some commentators have made out.